To determine the mass of metal deposited at an electrode. In gravimetric analysis determination of metal concentration is depends on the weighing process of the metal. 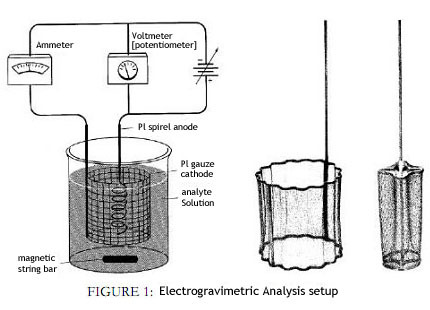 But in electrogravimetery the metal concentration is determined by using electrochemistry. It is an easy and accurate method. The Electrogravimetric analysis is done by depositing the metal (whose concentration to determine) on a pre-weighed electrode, and the concentration can be calculated from the weight gained by that electrode. For example determination of copper is the most important application of electrogravimetery. The whole process is carried out in an electrolytic cell, which consists of two electrodes an anode and a cathode with an external electrical energy supply. On Cathode deposition of the metal takes place due to the reduction of metal, and it is connected to the –ve terminal of the energy source. On Anode oxidation occurs, and it is connected to the +ve terminal of the energy source. Now a day’s one of the electrode is used as a stirrer for stirring the analyte solution. Fisher electrodes are used in this process. In this process the current is kept constant, and potential is increased. Here no control of the potential of the working electrode is exercised, and the applied cell potential is held at a more or less constant level but provides a large enough current to complete the electrolysis in a reasonable length of time. And a fixed amount of the current can be passing between the anode and cathode. The limitation of constant current electrolysis is it cannot be used for the separation of ion in a solution containing single species. It is the simplest way of performing an analytical electrolysis is to maintain the applied cell potential at a constant value. It is more used in the separation of the components from a mixture in which the decomposition potentials are not widely separated. For example the determination of copper from an acidic solution (either nitric acid or sulphuric acid solution or mixture of two acids) at constant current. Suppose an emf of 2-3 V is applied then the reaction taking place are given below. Electro deposition is governed by Ohm's law and Faraday's two laws of electrolysis. a) In electrolysis the amount of substances liberated at the electrodes of a cell is directly proportional to the amount of electricity which passes through the solution. is the time in seconds. b) The mass of substances liberated is directly proportional to the relative equivalent weights of those substances at a particular quantity of electricity applied. In electrogravimetery the determination of metal is carried out by above two procedures, at constant current or with controlled potential procedure. But constant current is limited. The apparatus for an analytical electro deposition without cathode potential control consists of a suitable cell and direct current supply. The voltage applied to the cell is controlled by the variable resistance ‘ ’. A current meter and a voltmeter indicate the approximate current and voltage. The voltage is then maintained at about the initial level until the deposition judged to be complete. It is used for the determination of concentration of chemical elements very accurate and precisely in quantitative analysis. In a solution the different species are separated by selectively plating out and removing out. It is used in electrochemical methods for removing interferences. In organic synthesis electro synthesis is used by organic chemist for conducting oxidation or reduction reaction.